Manchester, UK - Oct. 11 -- More than 30 were arrested here yesterday (Saturday) when a grouop of demonstrators against Islam clashed with anti-racism protesters, according to police. 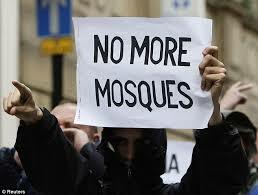 "No More Mosques in England"
..said large posters being waved by English Defence League (EDL) in the faces of supporters of Unite Against Facism. Trouble broke out just as..
..the two groups faced off in Manchester, northwest England. Hundreds of policemen wearing riot gear separated the EDL protesters, who waved placards saying "No More Mosques in England", from the rival demonstration across a square in the city. Police said a total of around 2,000 people took part. A police spokesman said most of the arrests were for public order offences, but no one was injured. It was the latest protest mounted by the EDL, after a similar demonstration in England's second city, Birmingham, last month and a protest by an affiliated group in London on the anniversary of the September 11 attacks that occured in U.S. eight years ago. Its supporters were planning to hold a two-minute silence for British soldiers killed in Iraq and Afghanistan before singing the national anthem. The anti-Islamic group denies it is racist, insisting in a statement on its website that it is a "multi-ethnic, multi-faith organisation". More than 2,000 people were protesting in political demonstrations in Manchester this afternoon. Anti-Islamic protesters from the English Defence League (EDL) were involved in a face-off with counter-campaigners from Unite Against Fascism (UAF) at the city's Piccadilly Gardens. A line of police officers, dogs and mounted police separated the two groups. Police said 30 people had been arrested on suspicion of public order offences, including one on suspicion of carrying a weapon. Four men were arrested ahead of the demonstration in a bid to avert problems. The clashes were the latest of a series involving the EDL, which has provoked angry confrontations in Birmingham and London in recent weeks. The EDL said it was taking to the streets in Manchester to protest against radical Islam and extremists. Its supporters carried placards reading 'Patriotism Is Not Racism' and 'No More Mosques In England'.